All around the world, Grace Brethren churches were praying for opportunities to introduce people to Christ at Easter services today. Here is a report from just one church–in Goshen, Indiana–taken from Pastor Jim Brown’s blog. We’d love to hear from others, as well, about how God worked today. Okay he did it again. As we prepared for the service today we had many decisions to make. We always walk into a Sunday begging God to show up and blow us away. At the end of each service we gave people an opportunity to trust Jesus as their Savior. To celebrate this new step in their spiritual journey we asked them to come and flip a switch on a wall that was built by a Grace attendee. The wall contained 90 switches with 100 watt bulbs. Each service people came up and flipped the switch and received a switch cover as a reminder. And then God said I will show you… in the second and third service we turned on the lights of each person that trusted Jesus and began the spiritual journey. We gave the invitation at the end of the third service and the air was filled with joy as the board began to light up. And then it happened we had more people then we did lights. We ran out of lights. You should have heard the place as the last light was lit. It was a moment I will never forget, people cheered, clapped, shouted and praised Jesus. 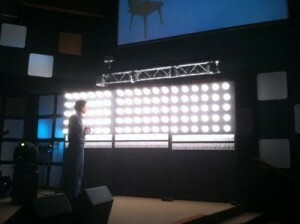 At the end of the day the 90 lights were lit with 8 other people making decisions to follow Jesus. A total of 98 people. As I type I am still overwhelmed by what Jesus did !